Two Year Warranty | Latex-free. With the largest screen size in its class, the Lenus™ > Arm is a fully-automatic digital blood pressure monitor that delivers fast, reliable measurements of systolic and diastolic blood pressure and pulse. The Lenus™ > Arm is designed for the medical professional requirements in a hospital setting, but it is also easy enough for a home user to measure blood pressure in the comfort of their home. The WHO (World Health Organization) recommendation function will assess your reading according to WHO standards and will also store up to 120 prior measurements in 2 zones so you can track your blood pressure readings over time. The impressive super large screen with big, high-contrast letters means easier viewing and usage for visually-impaired users. Just a few minutes a day can make the difference. Software: Lenus™ software was programmed specifically for the hardware we've selected to perform to the benchmarks we set when we designed the Lenus™. Because it accommodates each of the hardware requirements, it enables a seamless integration of all the parts to ensure greater accuracy. 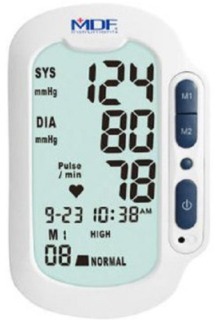 Display: Lenus™ > Arm boasts the largest digital display in its class of wrist-type digital blood pressure monitors. The impressive oversized screen size with large, high-contrast letters means easier viewing and usage for visually-impaired users. Battery meter indicates remaining battery life. Cuff & Inflation Bag: Resistant to abrasion, chemicals (chlorine and peroxide), and moisture, the adult Velcro® cuff is constructed of high-molecular polymer nylon, and features a D-ring for ease of use and an arterial indicator for accurate placement. Sized to meet American Heart Association recommendations, the artery indicator label and index range further ensure proper cuffing for correct arterial compression. The single-tube seamless inflation bag is constructed of crack-resistant, non-sticking, high-density hypoallergenic latex-free PVC.